One of the favorite BlazeMeter features is sharing reports. 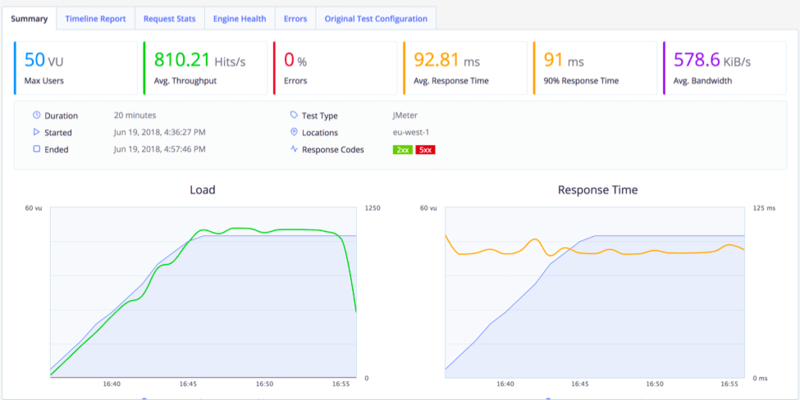 This means sending and presenting online and interactive performance test results to people who did not run the test themselves, but can find the information useful. For managers, the ability to see reports gives them visibility into the product and in the team and helps them manage tasks and people better. Share test results with product managers, to reflect the development progress. Work together within development scrum teams to analyze KPIs together. Provide visibility into development and product status, through a summarized executive reports. 1. Click on the Share button at the top right corner of the report section. 2. 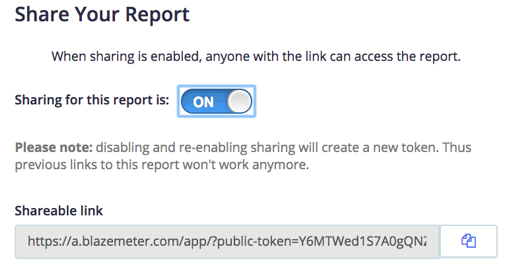 Toggle 'Sharing for this report' to ON and then copy the generated shareable link. By the way, you don’t need a BlazeMeter account to view the reports. Tests are full of private data and information that shouldn’t be shared with everyone, so we put security measures in place. By generating a unique link for the reports, we can ensure that sensitive test data like the files used, logs or raw data is not sent, but rather only the results. For example, you might be using a third-party vendor to manage and run your tests for you. In that case, you want to make sure that only the relevant people have access to your information and assets, and no one else is exposed to it. Your tester’s colleagues might have conflicting interests, as different employees of the same vendor might work for competing companies. In case your tester wants to consult with colleagues, she/he can use the “Shareable link”, which doesn’t contain scripts, data sets, logs and raw data. To learn more about reports and other BlazeMeter features, get a demo for your team. To try out BlazeMeter for yourself, put your URL in the box below and your test will start in minutes.